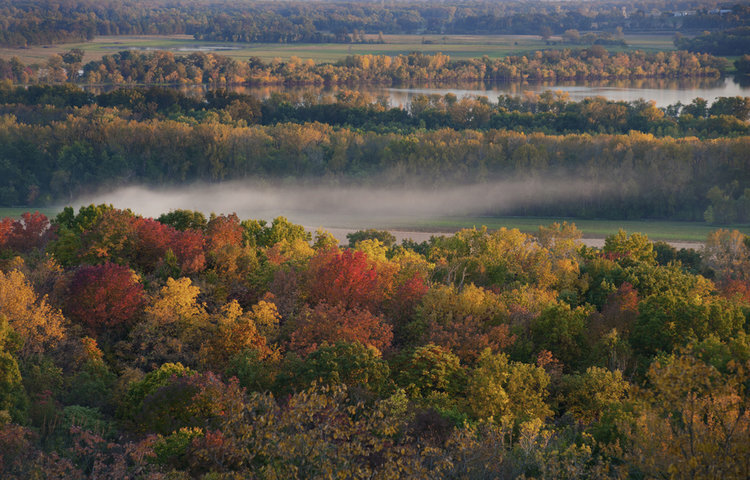 Pedal up the Mississippi River to one of the most colorful State Parks in the area. If you thought this place was beautiful at ground level you should see it from above. Spoked Adventures has partnered with Vertical Voyages to offer rock climbing on this trip to give you an aerial view of the Illinois River. This all-inclusive overnight bike camping trip to Pere Marquette is a new addition to our roster. This trip is one of the more accessible trips to those of all skill levels offering multiple route distances. While the camping is still primitive, the rest of the experience is far from it. Spoked Adventures will carry your gear, cook your meals, keep your beer cold and handle everything else along the way. It's all included in the package. We're excited to have the certified climbers from Vertical Voyages offer the opportunity to climb some of the area's freshest routes. Scared of heights? Don't worry. Our crew is experienced and promise the safest and most exciting climbing experience you've had. Participants will have the choice of two route lengths. Both rides will be fully supported, meaning that we will be carrying your gear and offering mechanical assistance. Day 1: The 54 mile route will be leaving Spoked Bikes & Stuff on Cherokee Street at 9:30 AM and will ride to the Piasa Bird parking lot in Alton, IL. This leg of the route is 30.2 miles and is estimated to take around two and a half hours. Here the 33 mile riders will join together for the next leg of the trip. The 22 mile route will be leaving from the Piasa Bird parking lot in Alton, IL shortly after the riders from the 30 mile route arrive. This should be around noon. Pere Marquette State Park is 22.6 miles and should take right around 2 hours. Day 2: After breakfast and breaking down camp, we will head over to meet the guides from Vertical Voyages to begin climbing. This portion of the trip will last approximately 4 hours. Following the climb, everyone will depart Pere Marquette Park around 9:00 AM. The route back will be the reverse of the route taken to the campsite the day prior. Riders for the 22 mile route can park their cars in the Piasa Bird parking lot. Check the map of the route to locate your preferred parking. All participants are required to download and review the following documents from Vertical Voyages. Waivers must be printed and signed in order to participate in any type of climbing activities. Food and water for the rides. There are a number of gas stations on the way for you to refuel. Fully functional bicycle. We will be offering mechanical support to cover incidentals and basic malfunctions.